Over the past 20 years, United has grown from a small cutlery sourcing company to the fastest growing, most creative and dynamic cutlery company in the world. United Cutlery now has the capability to create, design, engineer, market, manufacture or source, and distribute products in all categories of the cutlery and fantasy industries. Some of the categories/licenses they have includeLord of the Rings and Heroes. Eine alte menschenähnliche Rasse aus Mittelerde, Elben sind nobel, elegant und magisch harmonische Wesen im Einklang mit der Natur und Ihren Kräften. No shipping on this replica, only pickup at our store in Nijmegen or at our convention booth. 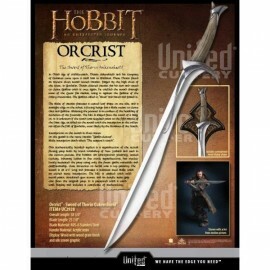 This replica features bronze-finished cast stainless steel blades and a hardwood handle shaft. 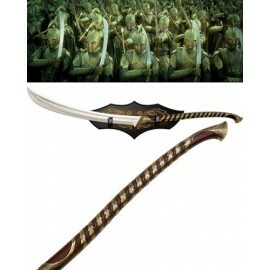 It is presented with a wood wall display featuring a Wood Elf graphic motif. 21 1/8" blades; 72 1/8" overall. Dieses authentisch detaillierte Schwert ist eine Reproduktion der Requisite im Film Der Hobbit: Eine unerwartete Reise und von Weta Workshop in Neuseeland produziert.